NASHVILLE, Tenn. – (Nov. 3, 2015) – Multi-Platinum-selling country music star Scotty McCreery teases his upcoming “Southern Belle” video with exclusive behind-the-scenes footage released to RARE today. 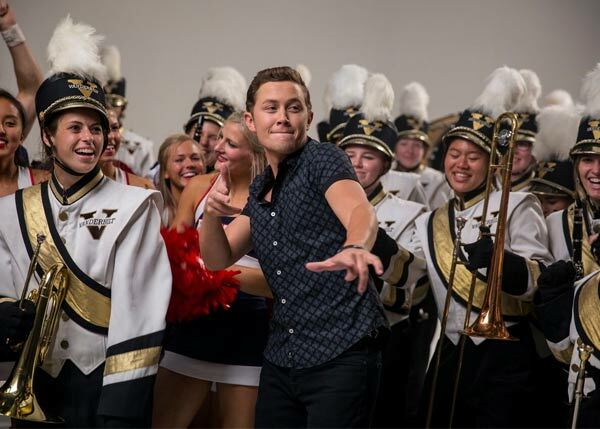 McCreery is seen letting loose on set and belting out his latest tune surrounded by cheerleaders and marching band members from all over Nashville including cheer squads from Belmont University and from Lipscomb University along with the Vanderbilt University Spirit of Gold Marching Band. “Southern Belle,” produced by Frank Rogers and written by Sean McConnell and Jason Saenz, is the lead single off McCreery’s highly-anticipated third studio album on Mercury Nashville / 19 / Interscope Records. The official video is due out this Monday, Nov. 9. Fans can preview and purchase “Southern Belle” by visiting umgn.us/SouthernBelle. McCreery recently wrapped up the Riot Tour 2015 with Rascal Flatts and he continues his own headlining dates through the end of the year. In addition to “Southern Belle,” the ACM and CMT Award-winner performs his Platinum-selling fan-favorites on tour including “See You Tonight,” “I Love You This Big,” “The Trouble With Girls,” his most recent Top 10 Gold-selling hit, “Feelin’ It” and many more. McCreery also recently announced the May 3, 2016 release of his very first book, Go Big Or Go Home: The Journey Toward the Dream, which narrates the young star’s journey from a kid imitating Elvis on the school bus to 30 million viewers across the country tuning in to see him win Season 10 of “American Idol” to building a successful country music career. The book will be available for pre-orders beginning Nov. 15. For more information, tour dates and more, visit www.ScottyMcCreery.com. Follow McCreery on social media at Facebook.com/ScottyMcCreery, Twitter.com/ScottyMcCreery and Instagram.com/ScottyMcCreery.